Over the past several years, I have seen a rise in the number of otherwise healthy adults presenting with methicillin-resistant Staphylococcus aureus (MRSA)-positive abscesses and cellulitis. What is the standard or care for treatment and prevention? While everyone employs incision and drainage as definitive treatment for simple abscess and adds MRSA-effective antibiotics for more severe infections, questions remain regarding use of mupirocin (Bactroban) and chlorhexidine (Hibiclens) for prevention and eradication of MRSA colonization of the patient and close family members. —Joel P. Myers, PA-C, MMSc, Bend, Ore.
1. Assume nothing, and culture everything. 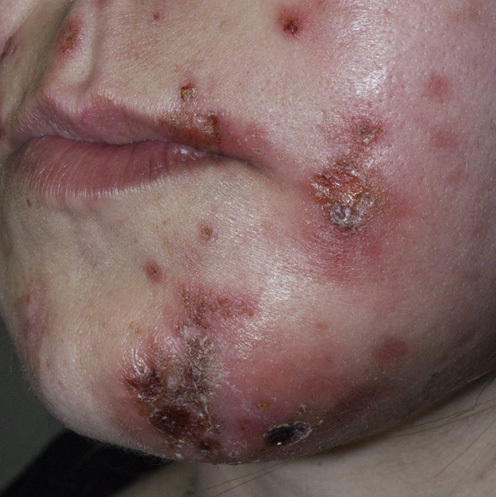 The history and physical appearance of a lesion cannot reliably distinguish streptococcal infection from staphylococcal infection or tell you anything about antibiotic sensitivity. 2. Abscesses don’t always need an antibiotic, especially those <5 cm and those in patients who are afebrile or nontoxic without signs or symptoms of systemic infection. Simple incision and drainage will do the trick. Make sure the patient knows where and whom to call in case the infection progresses. 3. If you decide to use an antibiotic, start with an agent that covers MRSA (i.e., doxycycline, minocycline, trimethoprim-sulfamethoxazole [TMP-SMX], or clindamycin [Cleocin]), and don’t be afraid to combine oral agents. You can always stop or change drugs when the sensitivity profile comes in. For example, a diabetic foot infection might require a fluoroquinolone to cover Pseudomonas as well as doxycycline for possible MRSA. A red streak on the face might call for dicloxacillin to cover streptococcus along with TMP-SMX for MRSA. Combining antibiotics in this way is not something primary-care clinicians are used to doing, so do not hesitate to ask an infectious disease (ID) specialist for advice. 4. For more serious infections, including those not responding to oral therapy, parenteral treatment with vancomycin, linezolid, or daptomycin may be required. Such cases obviously require hospitalization and consultation with an ID specialist. 5. Take the time to educate the patient about proper hygiene. Are towels or razors being shared? Is hand washing adequate? Insist on the use of alcohol-based hand gels and disposable paper towels. 6. Decolonization seems like a good idea, but it doesn’t always work. Even when it does, recolonization often occurs within months. To make matters worse, resistance to such agents as mupirocin has developed rapidly, so this topical antibiotic can no longer be recommended for routine use. Consider decolonization regimens only for an outbreak or recurrent infections in the same individual or household. Many protocols use chlorhexidine showers daily or every other day (to avoid skin irritation and breakdown) along with alcohol-based hand gels; some add systemic antibiotics (e.g., rifampin 300 mg twice daily) with doxycyline 100 mg twice daily for 10 days. For more information, see Harris A and Boyce JM. Prevention and control of methicillin-resistant Staphylococcus aureus. In: UpToDate. Rose BD, ed. Wellesley, Mass. :UpToDate; 2008.